Have you ever craved fried shrimp at 3am on a weeknight? What about fried clams at 9am Saturday morning? At the very least, we know you’ve had a hunger for fried frog legs at all different times of day. Well, good news - Lawrence’s Fish and Shrimp has you covered whenever you need. Lawrence’s is an old school shrimp shack on the Canal Street bridge. It's west of Chinatown, north of Bridgeport, and on the east side of I94, so it's not really Pilsen either. We like to think of Lawrence's similar to a micronation. Not really in any neighborhood, not officially recognized by other governments, but an independent haven of fried fish that sits suspended over the Chicago river. 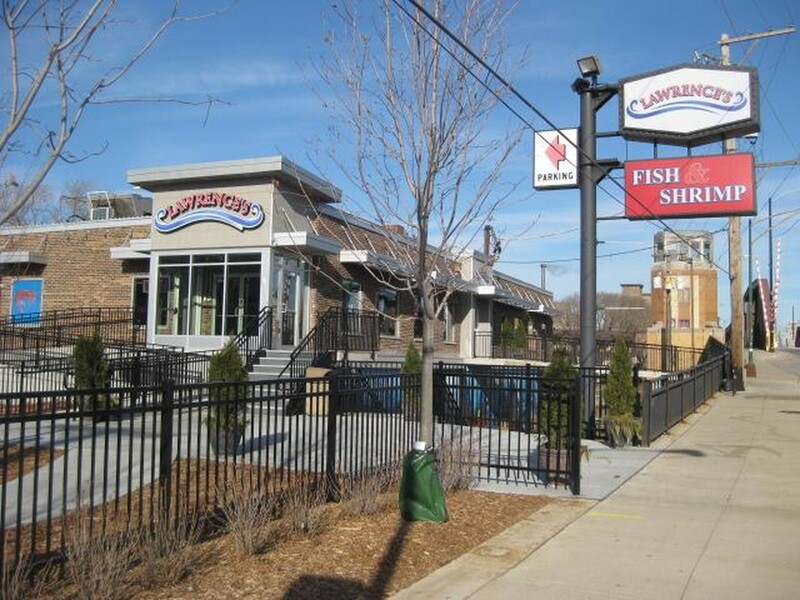 Lawrence's is all about fried seafood, which makes it a very particular place you want to visit. You've got to be in the mood, which is kind of a rule when it comes to eating a sh*t ton of fried crispy stuff. But when you are in the mood, Lawrence's is a solid spot for getting yourself some battered sea creatures. Large fried shrimp are the specialty, but oysters, clam strips, popcorn shrimp, catfish, and more, are all appropriate moves. Don't sleep on the seasoned peel n'eat shrimp either, it's a good change of pace. First generation American Lawrence Schweig opened this tiny storefront in 1950, and the place has passed on through other members of the family since his death in 1965. Lawrence intended to sell fish to the blue collar working class community in the area, which is why Lawrence's continues to be open 24 hours a day. Turns out, his shrimp were a big hit. It's a Serious Take Out Operation kind of place, but the once tiny shack has grown over the years and now includes a few tables if you want to cop a seat. And the shrimp - it's still delicious. Fried seafood is why you are at Lawrence's, and particularly the large fried shrimp. It's got a thick breading on it, but it's just the way Lawrence's does things. Fresh and hot while sitting there is the best way to enjoy them. We are catfish fans in general, and it's what makes these our favorite fried item outside of the large fried shrimp. Get some hot sauce involved. Fried oysters are a tricky thing, and you may either love them or hate them. If you like oysters in general, we say give these a try. Mixing some poultry in with your seafood is never a bad idea. We like the mini wing zings. Oh ya, follow up your fried stuff with some banana pudding dessert. Pro tip - use the vanilla wafers to scoop it all up.